rukawa ofcourse.. even on the interhigh jump he is still better in it.. he even manage to join the all-japan basketball team after they loose to aiwa high school in the third round of national championship. rukawa is defintely better. but since sakuragi is the protagonist in the show, i think he might get better than rukawa in time. even mitsui, who has been on a vacation, might be better if he has not stopped schooling. ehe, but playing basketball is not for a single person you know, it takes a teamwork for the group to win. any one here follow nba?? 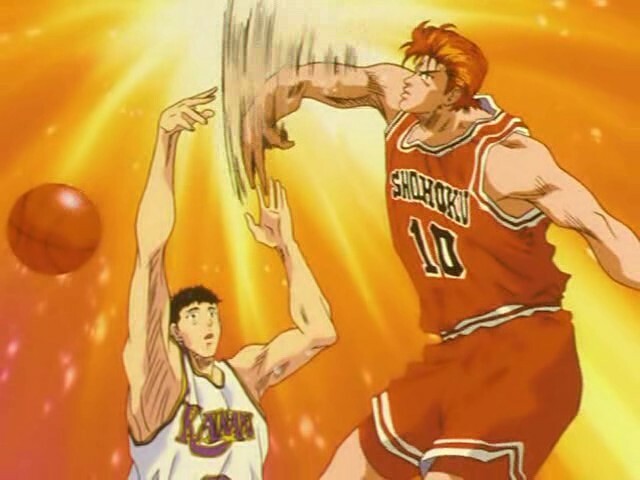 i like rukawa more !!!!!!!!!!!!!!!! Rukawa in 1v1. Sakuragi will never have those ball skills, on the other hands Sakuragi had more potential atletic wise. One of the funniest moments in the manga imo is how he tries an (Air Jordan?) dunk during warm up. That dunk jumping from the penalty line but he slams it right on the ring instead that he scores it but every one was hell a surprised that a high school kid was attempting that. Lets not forget he was only 16 and it was pointed out that their probably wasn't any other guy in high school who could've pulled that of. Rukawa even beats him in a 1v1 before they went to inter-high if I remember right. But again imo during that inter high match that he failed that dunk during warm up he completely showed while he doesn't has the ball skills, atletic wise he is so much superior to Rukawa, how he stops everyone with only 1y experience is just nightmarish. Let us not even begin his effect on the team, Sakuragi gives tremendous spirit boosts to his team with his attitude and his interventions. But it's like comparing Ben Wallace vs Kevin Garnett. coz he is soo funny!! its summer and vacation again.. I spoiled you guys a little too early about little busters!